An attempt to find and document extant but presently unknown populations of two of Alabama's rarest vertebrates: the Carolina Gopher Frog (Lithobates capito) and the Dusky Gopher Frog (L. sevosus). Three focal areas of the state include 1.) Shelby County and nearby areas, 2.) The southern two tiers of counties east of the Alabama River, extending north up the Chattahoochee to Barbour and Russell counties, and 3.) Mobile and Washington counties. The initiative will involve volunteers using Google Earth and other sources to identify potential breeding habitat (isolated, relatively open ephemeral ponds embedded in a pine or mixed pine forest matrix) and conducting calling male and/or egg mass surveys from January to March. 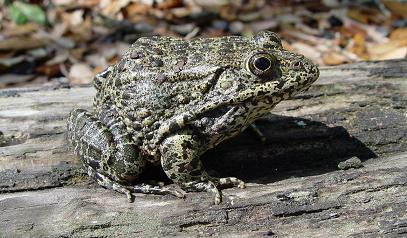 Lithobates capito is known to be extant at a few sites on Conecuh National Forest and nearby private lands in Escambia and Covington counties, but its historic Alabama distribution spanned south Alabama from Mobile Bay(one record near Fairhope, Baldwin County) to the Chattahoochee River (one north of Eufaula, Barbour County). Lithobates sevosus may be extirpated in Alabama, but suitable unsurveyed habitat exists. It is known to exist today at only a few sites in Mississippi, but probably historically occurred in Washington and Mobile counties in Alabama. And then there's a problematic and historic disjunct gopher frog population, probably L. capito, from Shelby County, south of Birmingham. Mount reported them from the 1960s, another specimen was collected in the 1980s, and I heard several males at a breeding pond (now destroyed) in the 1990s. A lack of good specimens makes it impossible to say with certainty whether this population is L. capito or something else altogether. After the Mississippi frogs, formerly considered conspecific with L. capito, were described as distinct, I regretted not collecting a specimen or two from the Shelby County pond so DNA analysis could be performed. I consider finding another Shelby County population to be the highest priority, and would like to see the most attention focused there. But volunteers from south Alabama could take up the cause to find populations nearer to them, which would also greatly contribute to our knowledge of these species. Gopher frogs can be detected by calling male surveys and egg mass surveys at the breeding ponds. The most likely time to hear calling males is mid January through mid March. Automated frog loggers can be used to increase coverage and sample time. In my experience, egg mass surveys are more reliable than listening for calls. Egg masses of gopher frogs are similar in appearance to those of leopard frogs, but can be distinguished with practice. Tadpoles can also be collected and reared, and advanced developmental stages of tadpoles can be identified to species.